Ardisia elliptica is a tropical understorey shrub that can reach heights of up to 5 metres. Undamaged plants in forest habitats are characterised by a single stem, producing short, perpendicular branches. Leaves are elliptic to elliptic-obovate, entire, leathery and alternate. 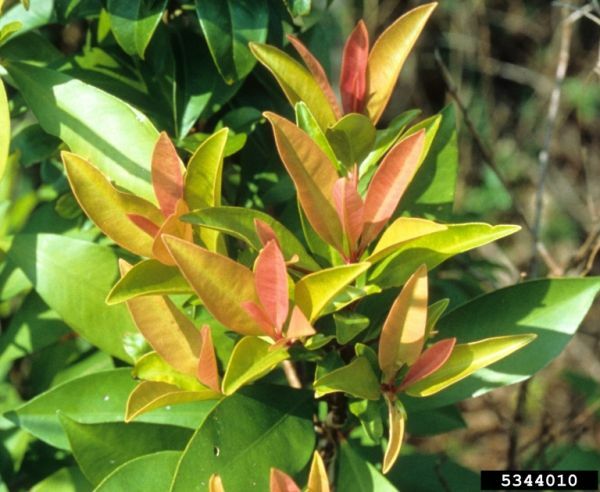 Most plants in South Florida have pink to red coloured petioles, although some populations have light green petioles. Umbellate inflorescences develop in leaf axils of branch leaves. Petals are light pink. 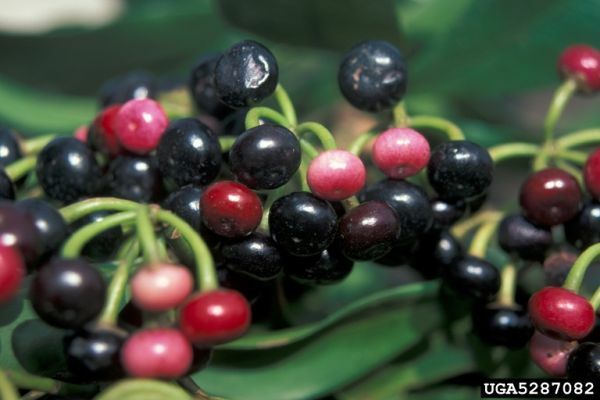 Fruits are drupes that first turn red as they mature and then deep purple/black. Pulp from the fruits will stain fingers a deep purple. Seeds are approximately spherical with a diameter of about 5mm. Ardisia elliptica readily invades moist disturbed forests, however, it has also been able to invade relatively undisturbed sites. Its fast growth and attractive fruit made it a popular ornamental plant in the past. From private and public gardens it has invaded natural areas. Close resemblance between it and A. escallonioides in Florida led to its introduction to the Everglades National Park in 1947. Because its fruit is readily consumed by both avian and mammalian frugivores, rapid spread across a landscape is possible. High seed viability (99%) greatly increases success of rare long-distance dispersal events. Seeds do not have any long-term dormancy (i.e., greater than 6 months), however, seedlings and juveniles can survive under very shady conditions for many years. Given enough light, juveniles rapidly develop into reproductive adults. In Florida (USA) habitats, there is very little adult mortality. Fruits are readily eaten by frugivores. Ardisia elliptica readily invades moist disturbed forests, however, it has also been able to invade relatively undisturbed sites. Its fast growth and attractive fruit made it a popular ornamental plant in the past. From private and public gardens it has invaded natural areas. Close resemblance between it and A. escallonioides in Florida led to its introduction to the Everglades National Park in 1947. Because its fruit is readily consumed by both avian and mammalian frugivores, rapid spread across a landscape is possible. High seed viability (99%) greatly increases the success of rare long-distance dispersal events. Ardisia elliptica is highly autogamous. Given ideal conditions, individuals can reach reproductive maturity in 2-4 years in the field and 1-2 years in a shade house. Large adults in bright forested sites have been measured producing up to 400 fruits. However, adults can also successfully set fruit under shady conditions. A shade-adapted species that can survive under extreme low light levels. In Florida it grows in alkaline soils and limestone substrates. Prefers moist forests. Seedlings can tolerate submergence for short periods. Although this method has not been documented, it is a likely invasion path.Sold as an ornamental. Review: Anthony L. Koop, University of Miami, Department of Biology, Coral Gables, Florida, USA. 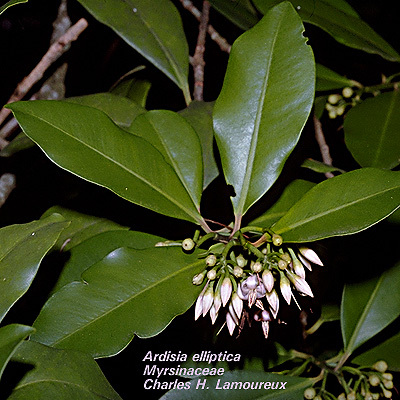 Recommended citation: Global Invasive Species Database (2019) Species profile: Ardisia elliptica. Downloaded from http://www.iucngisd.org/gisd/species.php?sc=52 on 22-04-2019. Ardisia elliptica readily forms dense monotypic stands that exclude native species. Due to high reproductive output and high shade-tolerance, carpets of seedlings (>400 plants per square metre) can form underneath adult plants under ideal conditions (moist soil and shallow litter). Seedling carpets and increased shade levels inhibit recruitment by native species. 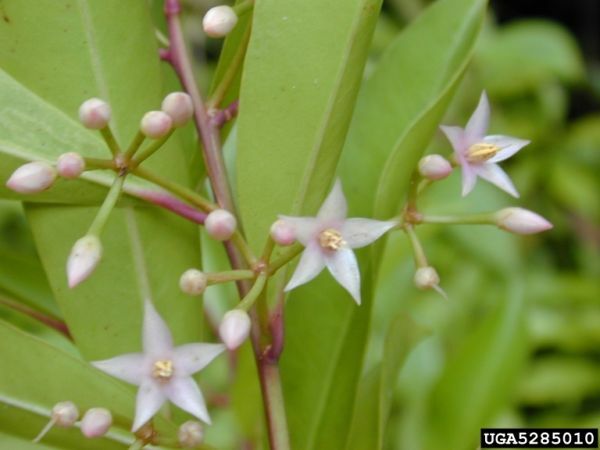 Preventative measures: A Risk Assessment of Ardisia elliptica for Hawaii and other Pacific islands was prepared by Dr. Curtis Daehler (UH Botany) with funding from the Kaulunani Urban Forestry Program and US Forest Service. The alien plant screening system is derived from Pheloung et al. (1999) with minor modifications for use in the Pacific islands (Daehler et al. 2004). Chemical: \"In areas with a dense groundcover of seedlings, a broadcast spray of a glyphosate herbicide is effective, but be careful to avoid damaging desirable plants. Mature specimens should be treated with a basal application of a triclopyhr herbicide mixed with an oil diluent\" (Hammer, 1996). 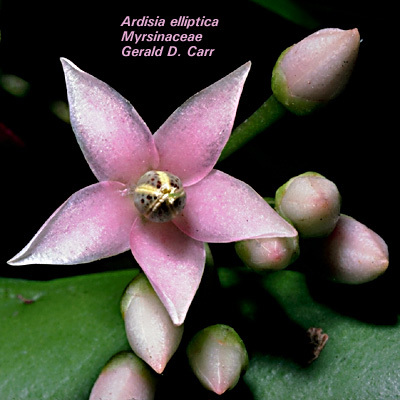 Informations on Ardisia elliptica has been recorded for the following locations. Click on the name for additional informations. Montague, T. L. 2000. The brushtail possum: Biology, impact and management of an introduced marsupial. Manaaki Whenua Press, New Zealand. Summary: An account (by several authors) that outlines the breadth and complexity of the possum problem in New Zealand. The book explores current and potential future management techniques, and measuring the benefits of controlling possums. Rash, J. E., Williamson, R. C. and Taylor, S. J. 1995. How green is your mudflat? Proceedings of the Australasian conference on Spartina control. Department of Conservation and Natural Resources, Yarram, Victoria, Australia. Summary: Collection of papers about the history of Spartina invasions in Australia and New Zealand and subsequent control attempts. Shaw, W. B. 1999. Options for Spartina control in Northland. Conservation Advisory Science Notes: 253, Department of Conservation, Wellington, New Zealand. Ward, B. and Henzell, R. 1999. Gel pruning for the control of invasive vines. ConScience, Department of Conservation, New Zealand. Summary: Gel pruning is being investigated as an environmentally friendly and effective chemical application system for selectively killing invasive vines. Cowan, P. E. 1990. The Brushtail Possum. The Handbook of New Zealand Mammals. King, C. M. (ed.) Oxford University Press. Summary: A comprehensive book on all 46 species of land-breeding mammals (mostly alien) that occur in New Zealand. Chapters are by local experts on each species. Chapter on brushtail possums is by P.E. Cowan. Summary: A complete reference to the ship rat in New Zealand. Langeland, K.A. and Burks, K. C (Eds) 1998. 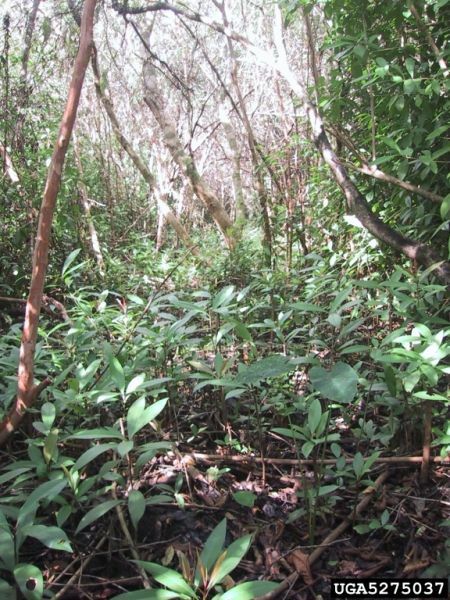 Identification and Biology of Non-Native Plants in Florida s Natural Areas, University of Florida. Ardisia elliptica. Ecological Entomology, ecology and control of invasive invertebrates, honeydew beech forest food webs.